I’ve read some reports from people who don’t like the new L&F. I don’t want to discuss this what I’d like to present you is how you can get the old L&F almost back. The default answer you’ll get is that you should switch to the Classic-Theme in Preferences > General > Appearance – don’t forget to restart because not all css-values are applied correct on the fly. Unfortunately this doesn’t fully fix it because tabs will now be rendered in blue which looks strange on e.g. Ubuntu. The problem is that our CSS-Engine currently can’t access system colors nor derive colors from them (something we’ll address in 4.3). Now to give a solution until then I’ve hacked today a theme which is able to access those native colors in the same way 3.x derived them. Version 0.1.0 of e(fx)clipse which is going to be released tomorrow is going to have this theme packaged with it! All others can fetch it from my github-repo. Note for all other theme creators: The e4-e3 theme comes with possibility to register named colors through a DS-Service, so if you want to do complex color calculations based on e.g. some system colors you can contribute named colors. Nice one, thank you. I didn’t know you where using Unity. In KDE the new theme looks even worse 😉 Mainly for the tabs which have a too big font. however, reverting to the classic theme works fine. 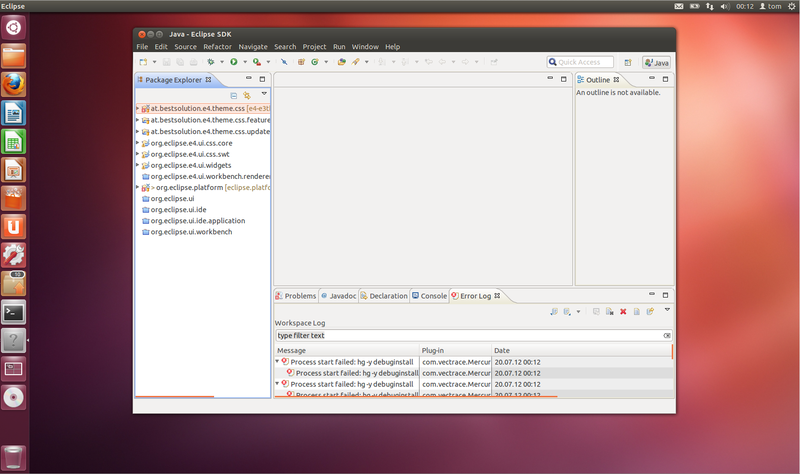 Gentoo, KDE-4.9.00, Eclipse Juno Release Build id: 20120614-1722. Classic, Default, Gtk themes have big fonts and no way to change it. All other fonts: window title, editor is ok, as you can see. I can change them via system settings or eclipse settings. Such thing only with main tabs. The Tab-Fonts are defined in the CSS used so changing the system fonts does not help you for them. Can you try installing https://github.com/tomsontom/e4-e3theme/downloads. This one does not set a font via CSS so you should get the system default. Restart your eclipse after having switched the theme. 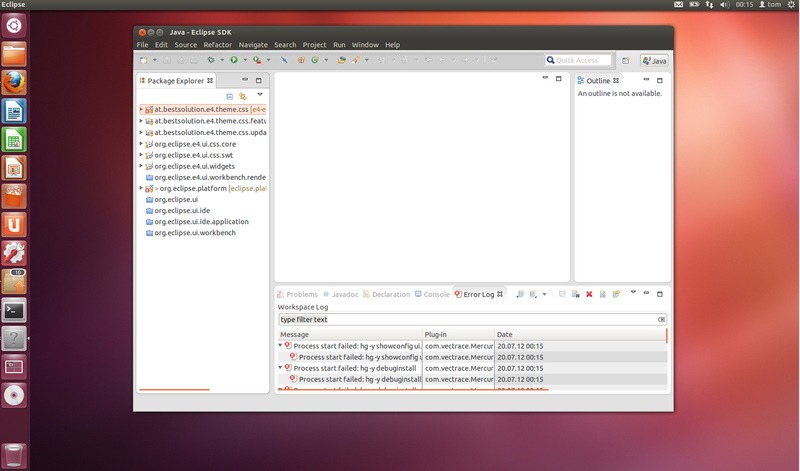 Can also please file a bugzilla with a screenshot to show how bad the default theme looks. Have to correct myself. There is not font set at all in the CSS so this is very strange. Could you give some instructions on how to use this theme. I have no idea what I’m supposed to retrieve from the git repo, where to put it, or how to tell Eclipse to use it. Sorry for delay. I’ve tried theme from Your link and got the same result. Where I can post into bugzilla about bad default theme? Thanks for Your reply. https://bugs.eclipse.org/bugs/enter_bug.cgi?product=Platform&component=UI – my guess is that the renderer is using a font who scales so big. BTW is 3.8 looking also that bad? in particular, which theme have you downloaded? After that i’ve tried to change Eclipse theme in General – Apperance and got the same result – TITLE BIG FONTS.